This "gateway" to fun and adventure in the great outdoors is located on the north shore of Big Bear Lake in the heart of the San Bernardino Mountains. 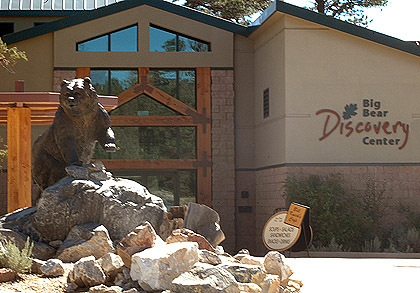 Visitors and residents use the Discovery Center to begin their exporation of the wild side of Big Bear. Investigate Big Bear through an exhibit, gather supplies for your own learning adventure, or make plans to join a naturalist guide on a Discovery Tour. With the help of knowledgeable staff and volunteers at the Discovery Center, you and your friends and family will learn the stories of this incredible alpine ecosystem to discover your place in this wild world.